It’s very important to recognize what is news and what isn’t. Your media representatives will appreciate it when you provide them with important, timely, factual information that is relevant to their readers. A press conference is a gathering of news media representatives in order to announce breaking news and/or update a breaking story as it unfolds. An example of an appropriate press conference is to update the media during or immediately after a severe disaster. In most fire departments, press conferences are not common. They should only be used for major news coverage. Other events can also be useful in attracting local media. They should be pitched as media events, but not as press conferences. 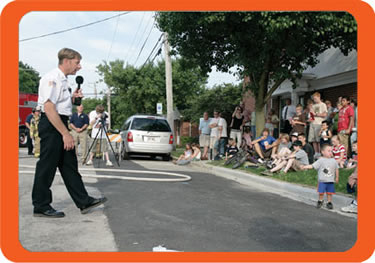 For example, you might invite the media if you host a live fire demonstration or host a fire station open house. If you are hosting an event, you may want to reach out to the media with a news advisory instead of a news release. This is a very brief document that lists the Who, What, Why, Where, and When of the event. It is intended to achieve media participation. At the event, you can present additional information through news releases and fact sheets. Many news outlets have staffers known as daybook editors who compile events for publication/broadcast. Your media list should include these media representatives. This Word document contains a sample news advisory that you can tailor for your community. Working with the media can be an effective way for you to increase awareness within your target audience. Be prepared to make the most of these opportunities, whether you are pitching a story or are responding to a reporter’s questions. Prepare for interviews and other media interaction. Anticipate what the reporter is likely to ask. Review your talking points, data, etc. Think about how you will frame your answers but don’t memorize them. Use the Internet to read past media coverage so you will have an idea of how your topic has been covered previously, how the reporter works and if they have a bias that may affect your ability to communicate your points.